For the most part, moderns have been as unkind in their treatment of Phocas as their Byzantine predecessors. Prominent scholars such as J. B. Bury, A. Pernice and R. Sprinter not only defend Byzantine authors' assessments of the emperor, but add their own invectives against Phocas as well - referring to him as "a shapeless monster" and concluding that he was "the most perverse and ferocious tyrant that ever donned the imperial diadem. "[]Others have blamed Phocas for everything from the institutional breakdown of the empire to indirectly causing the Moslem conquests. [] Before one can make a valid assessment of Phocas's reign, however, it is necessary to understand both the state of the empire when Phocas came to power and the motivations of those who recorded the events of his reign. By the time of his death in 565, Justinian had come closer than any other Byzantine emperor to reconstituting the old Roman Empire. He had reestablished imperial authority in Italy, Africa, and part of Spain. The empire and its subjects, however, benefited far less than Justinian had hoped from these conquests. Hindsight, in fact, reveals that the ambitious emperor had dangerously overestimated the empire's capabilities. During the thirty-seven years separating his reign from that of Phocas, it became clear that, in return for momentary glory, Justinian had bestowed upon his successors the arduous burden of managing an over-extended empire whose resources he had drained and whose institutions and infrastructure proved too weak to meet the task at hand. Though Justinian's immediate successor Justin II (565-78) realized that his predecessor had stretched the empire's finances to the limit, he refused to concede any of the territories that Justinian had conquered. Instead, Justin attempted to cut costs by refusing to pay subsidies to the Avars - a troublesome people whom Justinian had found easier to pay off than to fight. While Justin's policy towards the Avars had no immediate consequences, in the long run it proved disastrous. Cut off from Byzantine funds, the Avars in search of new sources of wealth made an alliance with the Lombards, who themselves had been traditional allies of the Byzantines. The two peoples then proceeded to attack the Gepids - a people whose lands bordered Byzantine territory - and seize control of their lands. Having enriched themselves at the expense of the Gepids, the Avars became a powerful force on the Danube. Soon the Avars would begin an inconclusive war with the Byzantines and would remain a dangerous foe for many years to come. The Balkan frontier, however, was not the only region that proved to be a problem for Justin. Very early in his reign, virtually every region that Justinian had brought under imperial control came under attack. The Visigoths began attacking Byzantine territories in Spain, the Lombards began attacking Byzantine lands in Italy, and the Moors began attacking Byzantine lands in Africa. Justin neither significantly reinforced these areas under attack nor withdrew from them. Instead, Justin, like his predecessor, sought to expand the empire in a new direction. After listening to appeals from Armenians under Persian rule who were plotting a rebellion and consulting with tribes who were already raiding northern Persia, Justin decided to invade Persian territory in 572. By late 573 the Persians had not only defeated the invading Byzantine force, but had also launched a formidable counterattack and soon took the key Byzantine stronghold at Dara. This defeat proved too much for Justin and reportedly drove him insane. Justin's successors proved no more adept at coping with the problems plaguing the empire. Though Justin had miscalculated the effects that a war against Persia would have on the empire, he had at least proved to be a better administrator of the imperial treasury than Justinian. Thus, while Justin's successor, Tiberius (578-582), inherited an empire plagued by enemies on all fronts, at least his predecessor had left him an empire whose treasury was not as over-extended as its frontiers. Tiberius at once employed the ample resources of the empire to pay off the Avars and prevent the Lombards from consolidating their power by inducing some of their war leaders to block the election of a new king. Even after achieving these goals, Tiberius failed to restore total peace in the empire's European territories; for the Slavs had begun to raid Illyricum and before his reign ended they had invaded Greece and reached the city of Athens. Nevertheless, having achieved a temporary truce with the Avars and the Lombards, Tiberius could concentrate on fighting the Persians. Tiberius's able general, the count of the Excubitors, Maurice, defeated the Persians and forced them to retreat to Dara. Maurice, however, was unable to follow up this victory because he had to rush back to Constantinople where Tiberius lay mortally ill. Not having a son to whom to leave the empire, Tiberius had Maurice (582-602) crowned Augustus the day before his death. Tiberius, like his predecessor, had neglected to address the problems that had plagued the empire for decades by reforming its institutions and infrastructure. Instead he had opted to achieve temporary relief by paying off key enemies. Maurice, therefore, inherited an empire not much securer, and much less poorer than the one Tiberius had inherited from Justin. Maurice quickly realized that in order to insure the empire's security he would have to deal with three major threats - the Persians along the eastern frontier, the Lombards in Italy, and the Slavs in the Balkans. In addition, by spring 583 the Avars were demanding an increase in the subsidy that the Byzantines had paid them during the reign of Tiberius. Thus, Maurice found himself facing the dilemma of having to fight at least three (and possibly four) major wars, but having the financial and manpower resources to fight only one. Understanding his financial bind and fearing that giving in to the Avars' insistence for a larger subsidy might encourage further extortion, Maurice at first refused to acquiesce to their demands. Unfortunately, this only prompted the Avars to invade the empire and after losing a few cities to them Maurice agreed to increase the subsidy by the amount that the Avars had demanded. Maurice's attempts to cut costs in other ways proved even more dangerous. Having temporarily bought off the Avars, Maurice was able to transfer enough soldiers to the east to swing the war against the Persians in his favor. However, when the emperor sought to cut costs by supplying his troops directly with arms instead of giving them the usual generous arms allowance - effectively cutting their pay by a fourth - the army rebelled. The army's discipline was eventually restored when the troops finally received their full pay. This episode provided Maurice with a key lesson concerning the importance of maintaining the favor of the army. Unfortunately it was a lesson that Maurice would fail to remember. In the meantime fortune shifted in favor of Maurice. A Persian general named Varahran, who had been humiliated by the Persian King Hormisdas, marched against his former lord and defeated an army sent to stop him. Hearing of this defeat, the Persian nobility overthrew Hormisdas and replaced him with his son Chosroes II. In turn Chosroes was driven out of Persia by Varahran, who seized the crown for himself. Chosroes pleaded with Maurice to help him regain his crown. In return for his aid Chosroes offered to surrender to the Byzantines most of Persian Armenia and to return the cities of Dara and Martyopolis. Although the Balkans were still occupied by Slavs and the threat of the Avars remained, Maurice agreed to help Chosroes regain his crown. The venture proved to be a great success for Maurice. Chosroes was returned to power, the Byzantines received the territories promised them and peace was secured on the eastern frontier. Fresh from his victory along the eastern frontier Maurice sought to pacify other troublesome areas of the empire and decided to move first against the Slavs in the Balkans. As usual, however, the emperor quickly found himself short on the resources needed to conduct war. Realizing that he could not afford to economize on rations, he once again attempted to cut the pay of his soldiers. In the end, in order to prevent another mutiny, the emperor was forced to increase the pay of the army. Faced with this added expense, Maurice realized that he could only fight one war at a time and chose not to reinforce other areas of the empire until the Balkans were secure. Byzantine forces in Africa, facing a renewed threat from the Moors, and Byzantine forces in Italy, facing a renewed threat from the Lombards, were therefore left to fend for themselves. Even after Maurice's generals had achieved victory over the Slavs the Balkans were not completely pacified. While Byzantine forces were dispersed over the Balkans mopping up remaining pockets of Slav resistance, the Avars once again invaded the region. Unable to concentrate their forces quickly enough to mount an effective defense, the Byzantines were quickly pushed back most of the way to Constantinople. Fortunately for the Byzantines, plague soon broke out among the Avars and its devastating effects, along with Maurice's promise to raise the tribute the empire paid to them, convinced the Avar Kagan to make peace with the Byzantines. Although Maurice managed to raise the tribute promised to the Avars, the task proved difficult because the plague had not only broken out among the Avars but in Constantinople, Anatolia, Italy, Africa and other regions of the empire as well. Despite the added financial burdens that the plague had placed on the empire, he decided to strike back at the Avars while they were still suffering from the plague. The campaign against the Avars proved to be successful. Finally, Maurice had managed to push the empire's enemies across the Danube. The cost of this operation, however, had been enormous. And in order to keep the Avars and Slavs from crossing the Danube again it proved necessary to maintain a large force along its banks. This added expense was one that he found difficult to afford. In addition, in 602 a famine broke out in Constatinople and set off rioting throughout the city. This calamity served as a graphic reminder that the empire's resources had been stretched to the breaking point. In order to economize Maurice once again attempted to cut military expenses. The emperor decided that in order to save on rations and ration allowances he would order the soldiers along the Danube to cross the river, where they were to winter in Slavic territory and live off the land. This decision proved fatal for Maurice. []The army mutinied and within a short time its representative, a junior officer by named Phocas, replaced Maurice as emperor. Fortunately for modern scholars, the invective histories of various Greek authors are not the only sources for Phocas's reign that remain. Early in Phocas's reign Pope Gregory I and the future Patriarch of Jerusalem, Sophronius, heaped praise after praise on the usurper. And the saintly status of these authors insured that their works would survive Heraclius'sdamnatio memoriae of Phocas. In addition there also remain a number of Syriac writings that make mention of important events surrounding Phocas's reign. Unlike their Greek counterparts, the authors of these Syriac sources tended to belong to various "non-orthodox" sects, including Monophysite and Nestorian Christians. [] Not surprisingly, these Syrian authors provide moderns with details lacking in the Greek sources. Phocas did not begin his career as a villain. Even his bitterest critics like Theophylact grudgingly admit that the mob cheered his triumphal entry into Constantinople following his successful coup. [] Pope Gregory I praised the new emperor as an instrument of God who lifted the "yoke of tribulation" (Maurice) from the necks of the empire's citizens. [] Such adulation, however, was not to last; for Phocas soon found himself plagued with the same sorts of crises that had brought down his predecessor and was forced to rely, either by necessity or lack of creativity, on the same weak institutions that had already proven inadequate for the tasks at hand. The problems resulting from overextension that Byzantine rulers faced along the frontiers of their empire have been addressed above in ample detail. In order to appreciate fully the difficulties faced by Phocas it is now necessary to examine the intrinsic weaknesses of the institutions on which the new emperor depended in order to maintain his, and the empire's, security. In the past a number of prominent scholars have suggested that the senatorial elite in Constantinople was similar in composition and power to its counterpart in the West - i.e. it was a powerful land-owning aristocracy capable of offering key challenges to imperial authority. [] Recent scholarship has demonstrated that this was far from true. The wealth of the landed aristocracy in the east never came near to their counter-parts in the west and their estates never dominated the economy of the eastern Mediterranean as those of their Roman counterparts had in the west. [] To the contrary, throughout the period small plots held and worked by free peasants continued to play a key role in the economy of the region. [] Far from being a major power broker in imperial politics, the elite of Constantinople was primarily made up of appointees of the emperor, heavily (if not totally) dependent on his patronage, and, therefore, unlikely to offer any real independent political opposition to him. This system of imperial patronage was in truth a spoils system in which loyalty counted more than capability. Since, in the realm of politics, blood is often thicker than water, it comes as no surprise that relatives of the emperor benefited the most from imperial patronage - receiving appointments to key positions in the imperial bureaucracy. In sixth and early seventh century Byzantium, the safety of the dynasty at Constantinople counted for more than an efficient bureaucracy or a secure frontier. Ensuring a loyal aristocracy at Constantinople was not the only measure that Phocas and his sixth century predecessors took in order to insure their security. For some time one of the most volatile of the Constantinopolitan political groups had been the Circus Factions. Drawn from various quarters of Constantinople and representing the interests of the social classes from these respective areas, the demes were a force that Byzantine emperors both utilized and feared. [] Desiring to prevent another incident like the Nika revolt that occurred during Justinian's reign, late sixth century Byzantine emperors made use of demarchs - administrators that they appointed over each deme to oversee their activities and provide some measure of control. Thus, having established a fair degree of control over the Constantinopolitan aristocracy and masses, sixth century emperors, surrounded by the immense walls encircling the capital, became lulled into a false sense of security. While Justinian's successors had been able to maintain a firm grip on the capital, their hold on the provinces proved far less secure. Many in the provinces, because of the heavy taxes it imposed and the imposition of billeting troops, despised the central government. Religious disputes provided an even greater source of conflict between provincials and the central government. Since the secular bureaucracy had largely collapsed by the end of the sixth century, the central government increasingly came to rely on the hierarchy of the Orthodox clergy to administer the provinces. However, conflict between the Chalcedonian officials sent from Constantinople and Monophysite majorities in the Syrian countryside and throughout Egypt was always tense and occasionally resulted in violence. [] The final years of Maurice's reign in particular were marked by severe persecutions of Monophysites throughout Syria and Egypt. This tactic in turn aroused intense anger against the central government and the Chalcedonian clergy who enforced imperial policy. Thus, the empire that Phocas seized from Maurice was one whose authority in the provinces was represented by an unpopular minority and enforced by military power. With the situation in the provinces already shaky when he came to power, Phocas was quickly faced with a major threat along the eastern frontier of the empire. Relations between Rome and Persia had remained good since Maurice had helped Chosroes regain his crown. Since that time the Byzantines had concentrated on reasserting their control of the Balkans, while Chosroes had been preoccupied with suppressing a revolt in the eastern portion of his empire. While the Byzantines had probably viewed Chosroes' return of thier property and surrender of areas that had already rejected Persian control as a moderate price to pay in return for their services in restoring his crown, the Persian king himself most likely viewed these concessions as a major blow to his dignity. By 602 the problems that Chosroes faced in the east had been resolved and, with the overthrow of Maurice in November of that same year, the Persian king now had an honorable pretext for attacking the Byzantines. Presenting himself as the avenger of Maurice's murder, Chosroes seized the opportunity to recover the areas that he had earlier ceded to Maurice and in 603 launched an invasion against the Byzantines - beginning a war that would last for over two decades and critically weaken both empires. As noted previously, Byzantine historians tended to be one-sided in their treatment of Phocas. It should come as no surprise then that among the many misdeeds attributed to Phocas was that he had been responsible for subsequent losses to the Persians. A careful examination of the sources, particularly Syrian and other provincial sources, however, reveals that for the first few years of the war the Byzantines proved fairly effective fighting against the Persians. [] In 609, however, the war turned decisively in the Persians' favor when Phocas was forced to withdraw most of the army from the frontier in order to deal with a dangerous rebellion that had spread from the province of Africa to Egypt. As a usurper with no dynastic ties to previous rulers, Phocas's claim to the emperorship had always been shaky. Phocas immediately sought to silence those who might voice concerns over his lack of dynastic ties by requiring the previous emperor's father-in-law to renounce his own claim to the throne. In effect, this move served as nothing less than a formal renunciation of the principle of dynastic succession. Having countered those who might question his lack of an imperial lineage, Phocas next moved to legitimize his accession by portraying it as something that had been divinely ordained. While previous Byzantine emperors had also justified their acquisition of power as being in keeping with Divine will, few had stressed this means of legitimizing their rule to the extent that Phocas did. [] Phocas sought to advertise his piety by contrasting his own reputation for orthodoxy with Maurice's reputation for heterodoxy. In keeping with this strategy, upon taking power Phocas publicly swore an oath of orthodoxy administered by the Patriarch Cyriacus. To further demonstrate his piety, Phocas moved his Patriarchal coronation to a church - something that would become a permanent fixture in Byzantine ceremony. Ironically, Phocas's success in overthrowing his predecessor and establishing himself as emperor despite his lack of dynastic ties prompted other ambitious men with access to military forces to attempt the same against him. The man who would eventually prove successful at replacing Phocas as emperor was Heraclius. Heraclius's father - whose name was also Heraclius - was the exarch (governor-general) of Africa. Together the father and son, as consuls, staged a rebellion against Phocas in 608. No doubt encouraged by the commitment of the imperial army against the Persians, a rebel army invaded Egypt in the summer of 608. Having paved the way for this invasion by bribing local garrison commanders and obtaining the support of Maurice's loyalists who had been displaced by Phocas's appointees, Heraclius was confident that his supporters could achieve a quick victory in Egypt and gain control of its riches and navy. In the end Heraclius' rebellion would expose the institutional weaknesses that had existed in the Byzantine Empire for decades. Like his predecessors, Phocas relied on safe, but largely incompetent, family members to man his bureaucracy and oversee his armies. Similarly, successful generals were often relieved and provincial administration was left in the hands of the dependable, but unpopular and administratively ineffectual, Chalcedonian ecclesiastical hierarchy. Shortly after Heraclius's forces entered Egypt, riots broke out in cities throughout Egypt, Syria and Palestine. Although sparked by news that a rebel army had marched into Egypt, these riots do not appear to have been prearranged by Heraclius's supporters. Instead, they resulted from the animosities that had festered in the provinces for some time and which imperial authorities had foolishly chosen to ignore. Understanding the gravity of the situation in Egypt, yet caught in the same institutional bind that had faced his predecessor, Phocas was forced to take a dangerous gamble. In order to crush the forces that had risen against him, Phocas decided to withdraw his soldiers fighting the Persians and send them against the rebels in Egypt. Not wishing to leave the frontier completely vulnerable, Phocas's general Bonosus was forced, for lack of options, to entrust the defense of the frontier to one of the least reliable forces in the empire - the demes. Unlike in Constantinople, where emperors had long ago reigned in these troublesome bodies by carefully overseeing their administration, the imperial government had only recently begun to institute reforms in the provincial demes. Thus, the demes that Bonosus entrusted with the defense of the frontier were themselves hotbeds of discontent, where deep animosities occasionally led to factional fighting. Once Bonosus reached Egypt a long, violent struggle ensued. The combatants endured long sieges, fought pitched battles and atrocities were committed by both sides. [] Locals used the war as an excuse to settle long-held vendettas against their enemies as rival factions sought to gain advantage by supporting one side or the other. Egypt, however, was not the only region to succumb to factional fighting. Deme violence broke out in Palestine as soon as Bonosus left the region on his way to Egypt. The civil war in Egypt eventually came to an end when Heraclius's supporters achieved victory. The end of this struggle, however, came too late for the Byzantines to salvage the situation along their frontier with Persia. In 609, with the defense of their eastern borders entrusted to the unreliable demes, Persian armies captured all of the Byzantines' key fortresses along their frontier and drove the Byzantines from Armenia. Yet even these defeats paled in comparison to the losses that the Byzantines would suffer in subsequent years. While forces loyal to him were achieving victory in Egypt, Heraclius made his way to Constantinople. Hearing of the arrival of the usurper's fleet, Phocas quickly acted to defend the city. Ironically, lacking any other options, Phocas relied on the same sorts of forces to mount a defense of the capital as Maurice had in 602. The Excubitors formed the heart of this force and were supported by the demes. Like Maurice, Phocas had awarded command of the Excubitors to an individual whom he thought he could trust - his own son-in-law, Priscus. Priscus, who had himself come to power under Maurice, however, was a true political opportunist. Aware that Egypt had fallen to Heraclius and witnessing the advance of the usurper's fleet, Priscus decided to betray his father-in-law and switch his allegiance to Heraclius. Without the support of the Excubitors, Phocas had virtually no chance to save either his throne or his life. The deme known as the greens, whose loyalty to Phocas had always been questionable, also threw its support to the usurper and the other deme, the blues, proved as ineffectual as ever as a military force. Deserted by his supporters, Phocas was seized by the Excubitors, who brought him before Heraclius. After cursing the fallen emperor, his self-appointed successor kicked Phocas and beheaded him on the spot. Phocas's right arm and hand were then cut off and his corpse was disemboweled, thrown into a skiff and burned. []Thus ended the career of the man who had shattered a record of stable imperial succession that had lasted for nearly three hundred years and who had brought to an end a line of rulers that dated back to Constantine. Ironically, the same could be said of Phocas's reign. While left unchallenged, Phocas proved capable of meeting a renewed threat from the Persians. Heraclius's revolt, however, would mark a crucial turning point in Byzantine history. Lasting over two years and costing thousands of lives, the revolt sapped Byzantine manpower and finances and left the frontiers largely undefended. This revolt would result in the loss of Syria, Palestine and Egypt to the Persians. Although Heraclius would eventually recover these areas, he would be able to hold on to them for only a brief period of time. Soon these areas would be lost to a new force from the east - the Muslims. Perhaps only when the Byzantines failed to successfully meet this new challenge did they fully comprehend the damage that they had sustained during the tumultuous events of the previous decades. Anonymous. Nestorienne Historie, Cronique de SJert. Trans. A. Sher. Patrologia Orientalis 4.Paris, 1907. _________. Chronicum ad annum 724 pertinens. Trans. J. B. Chabot. Corpus sciptorum christianorum orientalium. Scriptores syri. Series 3, vol. 4. Paris 1903. _________. Chronicum ad annum 819 pertinens. Trans. J. B. Chabot. Corpus sciptorum christianorum orientalium. Scriptores syri. Series 3, vol. 4. Paris 1903. _________. Chronicum ad annum 846 pertinens. Trans. E. W. Brooks. Corpus sciptorum christianorum orientalium. Scriptores syri. Series 3, vol. 4. Paris 1903. _________. Chronicum ad annum 1234 pertinens. Trans. J. B. Chabot. Corpus sciptorum christianorum orientalium. Scriptores syri. Series 3, vol. 14. Paris 1920. _________. Chronicon Paschale. Trans. M. and M. Whitby. Liverpool, 1989. _________. Die von Guidi herausgegebene Syrische Chronik. Trans. T. Noeldeke. Abhandlungen der kaiserlichen Akademie der Wissenshaften in Wien. Vienna, 1893. _________. Martydom of Emperor Maurice. Patrologia Orientalis 5. Paris, 1910. _________. The Seventh Century in the West-Syrian Chronicles. Trans. A. Palmer and S. Brock. Liverpool, 1993. George Cedrenus. Historiarum compendium. 2 vols. Ed. I. Bekker. Bonn, 1838. George of Pisidia. Bellum Avaricum. Ed. A. Pertusi. Giorgio Pisidia, Poemi: I. Panegirici epici. Ettal, 1959. _________. Heraclius. Ed. A. Pertusi, Giorgio Pisidia, Poemi: I. Panegirici epici. Ettal, 1959. _________. In Heraclium ex Africa redeuntum. Ed. A. Pertusi, Giorgio Pisidia, Poemi: I. Panegirici epici. Ettal, 1959. Gregory I, Pope. Registrum Epistularum. 2 vols. Ed. D. Norberg. Tournhaut, 1982. Gregory Bar Hebraeus. Chronography. 12 vols. Trans. E. W. Budge. Oxford, 1932. __________. Chronicon ecclesiasticum. 3 vols. Trans. J. Abeloos and T. Lamy. Paris, 1877. Jacob of Edessa. Chronicon. Trans. E. W. Brooks. Corpus scriptorum christianorum orientalium. Scriptores syri. Series 3, vol. 4. Paris, 1903. John of Antioch. Chronographia. Fragmenta Historicorum Graecorum 4. John of Ephesus. Lives of the Eastern Saints. Trans. E. W. Brooks. Patrologia Orientalis 17-19. Paris, 1923-26. John Malalas. Chronographia. Ed. L. Dindorf. Bonn, 1821. John of Nikiu. Chronicle. Trans. R. H. Charles. Oxford, 1916. Michael the Syrian. Chronique. 4 vols. Trans. J. B. Chabot. Paris, 1899-1910. Nicephorus, Patriarch. Breviarium. Ed. C. de Boor. Leipzig, 1880. ________. Short History, Ed. and trans. C. Magno. Corpus Fontium Historiae Byzantinae 13. Dumbarton Oaks Texts 10. Washington, D.C., 1990. Sebeos. Histoire d'Heraclius. Trans. F. Macler. Paris, 1904. Theophanes. Chronographia. 2 vols. Ed. C. de Boor. Leipzig, 1883. Theophylact Simocatta. Historiae. Ed. C. de Boor and P. Wirth. Stuttgart, 1972. _________. The History of Theophylact Simocatta. Trans. M. and M. Whitby. Oxford, 1986. Bury, J. B. 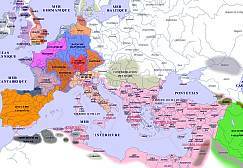 History of the Later Roman Empire from Arcadius to Irene. 2 vols. London, 1889. Dendias, M. "Études sur le gouvernement et l'adminstration Byzanz," Atti di V Congresso internazionale di studi byzantini. Rome, 1939. Cameron, A. Circus Factions, Blues and Greens at Rome and Byzantium. Oxford, 1976. _________. "Demes and Factions," Byzantinische Zeitschrift 67 (1974) 74-91. Fine, J. "Two Contributions on the Demes and Factions in Byzantium in the Sixth and Seventh Centuries," Zbornik Radova 10 (1967) 29-37. Frend, W. The Rise of the Monophysite Movement. Cambridge, 1972. Hendy, M. Studies in the Byzantine Monetary Economy 300-1450. Cambridge, 1985. Janssens, Y. "Les Blues et les Verts sous Maurice, Phocas et Heraclius," Byzantion 11 (1936) 499-539. Johnson, A. and L. West. Byzantine Egypt: Economic Studies. Princeton, 1949. Jones, A. H. M. The Later Roman Empire 284-602. 3 vols. Norman, 1964. _______. "Were the Ancient Heresies National or Social Movements in Disguise?" Journal of Theological Studies 2, new series 10 (1959) 280-98. Kaegi, W. E. Jr. "Byzantine Egypt during the Arab Invasion of Palestine and Syria: Some Observations." American Research Center in Egypt Newsletter 121 (1983) 11-15. ________. Byzantine Military Unrest 471-843. Amsterdam, 1981. ________. Byzantium and the Decline of Rome. Princeton, 1968. ________. "New Evidence on the Early Reign of Heraclius." Army, Society and Religions in Byzantium. London, 1982. Manojlovic, G. "Le people de Constantinople," Byzantion 11 (1936) 644-55. Maspero, J. Organisation militaire de l'Igypte byzantine. Paris, 1912. Olster, D. M. The Politics of Usurpation in the Seventh Century: Rhetoric and Revolution in Byzantium. Amsterdam, 1993. Ostrogorsky, G. "Agrarian Conditions in the Byzantine Empire in the Middle Ages," The Cambridge Economic History of Europe from the Decline of the Roman Empire. Cambridge, 1941. ________. Geschichte des byzantinischen Staates. 3rd ed. Munich, 1963. Pernice, A. L'imperatore Eraclio. Florence, 1905. Rouillard, G. L'administration civile de l'Egypte byzantine. Paris, 1953. Spintler, R. De Phoca imperatore Romanorum. Jena, 1905. Treadgold, W. A History of the Byzantine State and Society. Stanford, 1997. Whitby, M. The Emperor Maurice and His Historian: Theophyact Simocatta on Persian and Balkan Warfare. Oxford, 1988. [] George of Pisidia, Bellum Avaricum (ed. A. Pertusi) Giorgio Pisidia, Poemi, v. 1 (Ettal, 1959) 123-24. [] Heraclias (ed. A. Pertusi) 2.6-11. [] Theophanes, Chronographia (ed. C. de Boor) 1:290; Nicephorus, Breviarium (ed. C. de Boor) 3; Cedrenus (ed. I. Bekker) 1:708. [] J. B. Bury, History of the Later Roman Empire from Arcadius to Irene, 2 vols. (London, 1889) 2:206; A. Pernice, L'imperatore Eraclio (Florence, 1905) 7; R. Spintler, De Phoca imperatore Romanorum (Jena, 1905) 5. [] G. Ostrogorsky, Geschichte des byzantinischen Staates, 3rd ed. (Munich, 1963) 72ff; P. Goubert, Byzance avant l'Islam, 2 vols. (Paris, 1951) 1:271. [] The army had long seen Maurice as its enemy. As noted previously, the emperor had attempted on two prior occasions to cut its pay. According to John of Antioch [Fragmentia historicum graecorum, vol 5 (ed. C. Mueller) 35] this hatred for Maurice intensified when rumor spread through the army that he intended to betray it to the Avar Kagan as punishment for its misdeeds. [] D. Olster, The Politics of Usurpation (Amsterdam, 1993) 7. [] For an excellent study of these sources see: Olster, The Politics of Usurpation, 11-19. [] Theophylact, 8.1.7-8. The Chronicon Paschale (693) also recorded the joy that the citizens felt when Phocas entered the city. [] C. LJcrevain, Le SJnat romain depuis DioclJtien B Rome et BConstantinople. (Paris, 1888); M. Dendias "Itudes sur le gouvernement et l'adminstration B Byzanz," Atti di V Congresso internazionale di studi byzantini (Rome, 1939); G. Ostrogorsky, "Agrarian Conditions in the Byzantine Empire in the Middle Ages," The Cambridge Economic History of Europe from the Decline of the Roman Empire (Cambridge, 1941) 195-96. [] A. H. M. Jones, The Later Roman Empire, 2 vols. (Norman, 1964) 1:554-57; M. Arnheim, The Senatorial Aristocracy in the Later Roman Empire (Oxford, 1972) 168. [] For an exhaustive bibliography on this subject see: D. Olster, The Politics of Usurpation, 27-28. [] J. B. Bury, "The Nika riot," Journal of Hellenic Studies 17 (1897) 90-119; Y. Janssens, "Les Blues et les Verts sous Maurice, Phocas et HJraclius," Byzantion 11 (1936) 499-539; G. Manojlovic, "Le people de Constantinople," Byzantion 11 (1936) 644-55; G. I. Bratianu, Empire et 'dJmocratie' B Byzance," Byzantinishe Zeitschrift 37 (1937) 66-111; J. Fine, "Two Contributions on the Demes and Factions in Byzantium in the Sixth and Seventh Centuries," Zbornik Radova 10 (1967) 29-37; A. Cameron, "Demes and Factions," Byzantinishe Zeitschrift 67 (1974) 74-91; A. Cameron, Circus Factions, Blues and Greens at Rome and Byzantium (Oxford, 1976). []]For an excellent treatment of the conflict between Monophysites and imperial authorities see: W. H. C. Frend, The Rise of the Monophysite Movement (Cambridge, 1979). [] For a discussion of these Syrian sources see: D. Olster, The Politics of Usurpation 81-97. [] Olster, The Politics of Usurpation 165-182. [] John of Nikiu, Chronicle, trans. R. H. Charles (Oxford, 1916) chapters 107ff. [] John of Antioch, Chronographia, Fragmenta Historicum Graecorum 4, 38. [] Michael Whitby, The Emperor Maurice and His Historian: Theophyact Simocatta on the Persian and Balkan Warfare (Oxford, 1988) 27. Copyright (C) 2002, Kevin H. Crow. This file may be copied on the condition that the entire contents, including the header and this copyright notice, remain intact.